Whether you are a child or child at heart, there are many funny Foghorn Leghorn phrases that are sure to make you chuckle. This fictional Warner Brother's character created during the Golden Age of American animation was popular from 1946 to 1963. He first appeared as a guest for Henery Hawk in the 1946 Warner Brothers cartoon Walky Talky Hawky. Foghorn Leghorn was featured in 28 cartoons and had a variety of funny one-liners and loud, outspoken dialogues. The name Foghorn Leghorn directly represents the character. 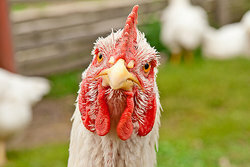 Foghorn refers to the loud, obnoxious voice of the character and Leghorn is a breed of chicken. Foghorn Leghorn was apparently inspired by two radio characters: a hard-of-hearing character called The Sheriff, played by Jack Clifford on a West Coast show in the 1930s; and then a Southern politician, called Senator Claghorn, played by Kenny Delmar on The Fred Allen Show in the 1940s. Many of the catchphrases used by Foghorn Leghorn come from Senator Claghorn. He had an on-going rivalry with Barnyard Dawg as they often tried to get the better of each other. There was another character, a weasel named Bill, who sometimes joined him in aggravating the dog. Another character he loved to torment was Henery Hawk, who often tried to catch and eat Foghorn. When he wasn't playing pranks, Foghorn was trying to win the affections of a widowed hen named Miss Prissy, which sometimes meant watching over her son, Egghead, Jr.
Foghorn Leghorn was opinionated, full-of-himself, and yet, somehow endearing. He loved a good practical joke. His sayings and his attitude can still be found funny today. There's something' a little yeeeee about a boy that don't like baseball. He's about as sharp as a bowling ball. Any of this getting through that little old blue bonnet of yours. Course you know this means war. Fortunately, I always carry a spare set of feathers. Gal reminds me of the highway between Forth Worth and Dallas - no curves. I say that dog is lower than a snake full of buckshot. Looks like the boy genius is tryin' to show me up. Nice boy but he's got more nerve than a bum tooth. Now let me know when I come to something that interests you. Now looka, I say, looka here. Oh, that woman got a mouth like an outboard motor. Scared - who me - course I'm not squared. Smart boy, got a mind like a steel trap - full of mice. That dog's as subtle as a hand grenade in a barrel of oatmeal. This boy's more mixed up than a feather in a whirlwind. What in the name of Jesse James do you suppose that is? What in the world's that hen up to now? Who's responsible for this unwarranted attack on my person? You just know I'm gonna do something about this. You know, there just might be a market for bottled duck. That's a joke, I say, that's a joke, son. One-liners Spoken to "The Boy"
Boy, you cover about as much as a flapper's skirt in a high wind. You'd like that, wouldn't you, boy. Put that egghead book down, boy. I say, boy, pay attention when I'm talkin' to ya, boy. Pay attention to me boy! I'm not just talkin' to hear my head roar. That's what I've been - I say, that's what I've been telling you, boy! Go, I say, go away, boy, you bother me. What's all the whoopin' and hollerin about, boy. Now cut that out, boy, or I'll spank you where the feathers are thinnest. Now that's no way for a kid to be wastin' his time, readin' that long-haired gobbledegook. Foghorn Leghorn: Looka here son, I say, son, did you see that hawk after those hens? He scared them, that Rhode Island Red turned White then Blue. Rhode Island. Red, White and Blue - that's a joke son. A flag waver. You're built too low. Fast ones go over your head. Foghorn Leghorn: Looky here, son, I'm no loud-mouthed schnook. Foghorn Leghorn: This is a dog, not a chicken. Chicken's don't look like dogs. Who told you this was a chicken, son? Nice boy, but doesn't listen to a thing you say. You got a bum steer, son. I'm a chicken, not a schnook. You're wrong, son. Barnyard Dawg: (Kicks Foghorn Leghorn) Schnook! Foghorn Leghorn: Nice girl, but about as sharp as a sack of wet mice. Foghorn Leghorn: Now what, I say, what's the big idea bashing me on the noggin' with a rolling pin? Clunk enough people and we'll have a nation of lump-heads. Let me guess, dearie. You're looking for a husband. Foghorn Leghorn: Well, you're going about it the wrong way, sister. You don't bat 'em on the bean with a rolling pin. That comes later. Foghorn Leghorn: (The weasel has put Foghorn in a boiling pot) Say, boy, wouldn't you, I say, wouldn't you rather have some delicious dog soup? The Weasel: (Shaking his head) Uh-uh, uh-uh, uh-uh, uh-uh! Foghorn Leghorn: (After turning the weasel on the dog) Like beating a dead horse - he's got no get up and go. Foghorn Leghorn: (Sees the weasel carrying off the dog) That boy's as strong as an ox, and just about as smart. Originally, Foghorn's voice was created by Mel Blanc. Later voice performances for Foghorn Leghorn were done by several actors, such as Jeff Bergman, Joe Alaskey, Bill Farmer, Greg Burson, Jeff Bennett, and Frank Gorshin. In addition to his own cartoons, Foghorn could also be seen in commercials and guest roles, such as in Who Framed Roger Rabbit? and Space Jam. "Foghorn Leghorn Sayings." YourDictionary, n.d. Web. 20 April 2019. <https://quotes.yourdictionary.com/articles/foghorn-leghorn-sayings.html>. Whether you are a child or child at heart, there are many funny Foghorn Leghorn phrases that are sure to make you chuckle. This fictional Warner Brother's character created during the Golden Age of American animation was popular from 1946 to 1963. He first appeared as a guest for Henery Hawk in the 1946 Warner Brothers cartoon Walky Talky Hawky. Foghorn Leghorn was featured in 28 cartoons and had a variety of funny one-liners and loud, outspoken dialogues.